On the PGA Tour, they call it “Total Driving.” That’s the stat that ranks players according to how far and straight they drive the ball. Currently, Bo Van Pelt is the Tour’s best all-around driver, but there are a number of top-ranked players on his heels, including Zach Johnson, K.J. Choi and this year’s Northern Trust Champ, Steve Stricker (see the sidebar at the end of this story for more on Stricker’s excellent driving). Each man loves to hit his second shot with a short club from the short grass. Then again, who doesn’t? In this article, I’m passing on my years of experience as a Burbank golf pro and giving you of my 10 favorite distance and accuracy tips. Some are old stand-bys, others are ones never before published in Golf Tips, but each one is easy to do and yields immediate results. Practice them and I guarantee you’ll hit the ball the farthest and straightest ever. Long hitters transfer energy from their body to the clubhead in the proper sequence of actions. Short hitters move all the same body parts, but in the wrong order. 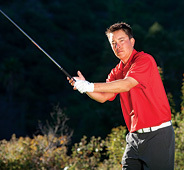 Good downswings unwind from the ground up, through your body: hips, shoulders, arms, hands and then finally the clubhead. Ben Hogan referred to this sequence as a chain reaction that multiplies your clubhead speed so it’s moving the fastest at the last possible moment. Notice here how my hips already are starting to unwind, my shoulders still are turned back, and the clubhead remains where it was at the “top” of my golf swing. I’ve just started to unwind, but you can see that what I’m doing is athletic and utilizing all my power. To drive it as far as possible, it’s vital to create and maintain lag in your downswing. Great drivers, from Ben Hogan to Sergio Garcia, have done this remarkably well. Still, most golfers don’t realize that to have a lot of lag, you first have to have the proper grip—one that’s in your fingers, not in your palms. To find the proper grip, hold the golf club in your right hand and take it halfway back. 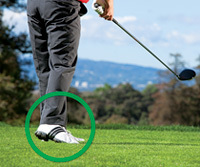 Now, place your left hand on it, holding the club in your fingers, with a slight bend in your left wrist. This helps you feel the right amount of lag and leverage. Now you’re ready to release it into the back of the ball. Now, just return the club to address with your hands on it the right way and start hitting shots. Accurate drivers see precisely where they want their tee shot to go, whereas wayward drivers see fairways as huge expanses with hazards all around them. That’s why, even though the average fairway is about 40 to 50 yards wide, they’re still difficult to hit. In the golf lessons I give, I tell my students to take a cue from all those trouble situations they’ve found themselves in, like punching out from behind a tree. I bet you’ve hit your best shots when you’re “stymied.” That’s because you narrowed your focus and your field of vision, and created a clear, precise picture in your mind. With little to work with, your body responded accordingly and reacted better with this detailed focus. As you can see in the picture (right), I’m doing it the wrong way. What I call the “lazy-chair slouch.” Everything’s turned, and my body isn’t properly engaged, I feel no torque or coil and have picked the club up. To hit more fairways, you must be precise with your aim. Stand behind the ball and pick out the smallest target visible (in this case, the tip of the upper limb on the far-right tree). Once you’ve chosen that target, hold the image of it in your mind’s eye as you swing. Now split the fairway. Keep Your Base WideTo really beat the golf ball, you have to create resistance in your lower body early in the backswing. This stores energy in your core and produces torque, in much the same way you twist a wet towel. A simple drill I give my students during their Burbank golf lessons that will help you accomplish this is to place a large object between your legs. (Here I’m using an impact bag, but you can use anything, as long as it’s about stance width.) Then, just hit some shots. As you do so, try to keep your base as wide and grounded as possible. You’ll find that this helps your initial takeaway feel wider and slower, and that you’ll store energy in your backswing. Too often, in an effort to hit it farther, a lot of golfers get everything turning—their knees, hips, core and shoulders. Doing that only results in a quick, sloppy swing. Much like a second serve in tennis, the “knockdown driver” shot was conceived to ensure greater accuracy. Its two key elements are choking down on your driver (as Anthony Kim does) and teeing the ball lower. Shorter clubs and lower shots are easier to hit straight. Now, just make a normal swing. Simple as that. 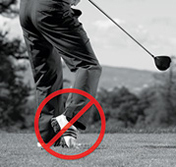 Your feet are the foundation of your golf swing, so how they move has a profound effect on the rest of your swing. Keep your back foot down until after impact, as your arms swing down and release past you and through. Even Tiger is guilty of this at times. Notice how he hits all his iron shots with his right foot on the ground but drives the ball with his right foot well up in the air. This is one of the reasons he often struggles to find fairways. Kenny Perry, on the other hand, is one of the longest, most accurate drivers of the ball. He keeps his right foot planted well into his followthrough. Good drivers have a lot of width and extension in both their takeaway and followthrough. They also continuously move their shoulders as they swing back and through. Stopping your shoulders from moving causes the arms to lift in the backswing or chop in the downswing, and that’s a recipe for disaster . Here’s a great drill to encourage a nice, wide and proper sweeping motion that I give students that take golf lessons from me. 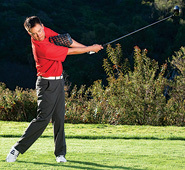 Place a medium-sized range bucket in between your arms and make half swings back and through (about hip high). Just keeping the bucket between your arms while you swing helps to maintain the distance between your hands and the center of your chest, as you turn back and through with your shoulders. Everybody gets loose in different ways. Rocco Mediate raises his driver over his head; Tiger Woods pulls his left sleeve back and raises his arms; Sam Snead said he liked to feel “oily.” Regardless of what these men do (or have done), they each have the same purpose: to eliminate tension in their arms and shoulders, so they can swing fast and freely. Experiment with some of their mannerisms, find one that suits you and swing. Accurate drivers develop and retain a consistent golf swing tempo for the entire round. 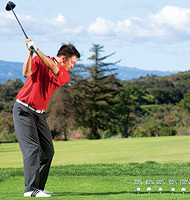 A good drill to help you find this is to experiment with a variety of different swing speeds. Simply, tee up five golf balls in a row and, with a full-length motion, make a swing that’s about 20% of your full strength. Hit the next one at 40%, the next at 60% and so on, until you beat the stuffing out of the last one. Varying your tempo will help you find the one that suits you best. As you go through the balls, you’ll find one speed that stands out as best. Stick with that “speed.” Annika Sorenstam’s caddie reminded her on every tee box to “swing six,” which meant a speed of six on a scale of 1 to 10, or 60%. This drill also helps you become more aware of any deviations from your standard tempo while you’re out playing. To make solid contact and drive the golf ball straight, you have to finish in balance. In this photo, notice how my weight is on my forward leg. I’m standing on the point of my right toe, my knees are together, the club is framed behind my back, and my belt buckle faces the target. I’m as in balance as it gets. Although it might seem antithetical to what we often see (and do), to hit the ball far, your goal should not be to swing as hard as you can. It should be to swing as hard as you can and still maintain good balance. Good drivers always finish in a poised, balanced position because they’ve swung within themselves and haven’t compromised their balance for more distance. I’ve probably had more success with this one simple thought than any other while playing competitive golf. If you don’t believe me, consider that Mike Weir swings through the ball to a balanced finish position and holds that pose for three seconds—on every shot.